There’s something about old school typewriters that make people (of my generation, at least) happy. The clickety clacking sound that the metal makes as it strikes the sheet of paper rolled up against the cylinder…the unmistakable ding when you “hit return”…the tactile experience of actually pounding the keys…all this, and more, make the typewriting experience a totally different one from what young kids know these days. Of course, it cannot be denied that laptops and tablets are more convenient and provide so much more. However, if you have those nostalgic moments like I more than occasionally do, you will love the idea of having an actual typewriter keyboard to pound away on. If you feel the same way, how about taking a look at this USB typewriter computer keyboard? It’s actually a Grey Royal Portable, an antique typewriter, which has been converted and fitted to be compatible with your computer. Whether you are a Mac user or a PC user, this USB typewriter computer keyboard will do the trick for those moments when you feel nostalgic about typewriters. It can even work with your iPad! If you are worried about the availability of keys that are normally not found on typewriters, there is no need. The person who fitted this USB typewriter computer keyboard has made sure that all standard keys are there, and even the function keys can be accessed via a special toggle key! Is it too good to be true? Not really, because this gadget accessory really does exist, and you can actually purchase one. The catch is that it costs a hefty sum: $699. That’s more than what you would pay for an iPad! 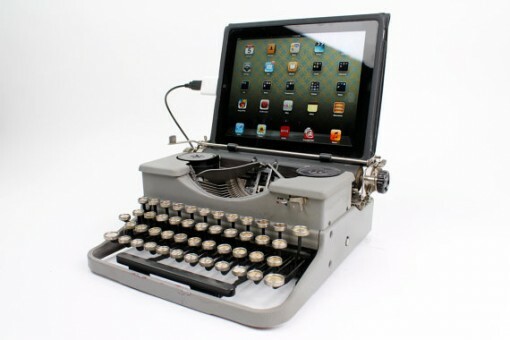 Then again, how many people can say they have a USB typewriter keyboard that works with modern devices?